As you probably already guessed, an undersized heating system won’t be able to generate enough heat to keep your living space comfortable. As a result, it will continue to operate for much longer than it was designed to do, trying to compensate. This is the exact opposite problem from if the system were too large, which we will get to below. 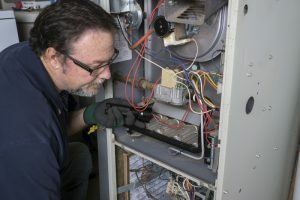 In the end though, having an improperly sized furnace will have the same result—your system will accumulate increased wear and tear and subsequently a shorter lifespan. That’s right, your heating system can actually be too large. What happens with a system that is too big is that it generates far too much output. Usually, this results in the thermostat shutting down the heater before it has a chance to complete a full heating cycle. This process is called short-cycling. Furnaces and heat pumps of all sizes are designed to operate in cycles—they generate a set amount of output over a set period of time before resting. If the furnace is shut down before it can ever complete a full heating cycle, it will begin to have negative effects. The various components of your heater will wear down more rapidly than they were meant to, and your heater won’t be able to actually heat your living space efficiently, since the thermostat will keep cutting it off. The overall lifespan of the furnace may even be compromised if allowed to short-cycle for long enough. Properly sizing a furnace or heat pump isn’t just a matter of getting the right physical dimensions for your home’s square footage. This is certainly part of it, but our pros look at far more than just that. They check the overall output of the system relative to the size of your home, in addition to how many windows and doors you have, what type of insulation you have, how many levels your home is, if you have cathedral ceilings, and more. Our heating professionals are able to get a very accurate calculation of how large your heating system needs to be. Hiring a pro will effectively eliminate the chances of you installing the wrong size heater.